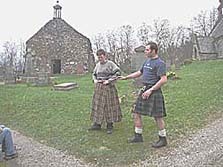 A Great Kilt, or "plaidie", was anywhere from five to nine yards long. 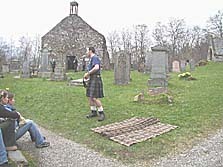 The wearer began by laying the material flat on the ground, gathering the center part of the plaid into folds or pleats. When they were done, they had a section of folds approximately half the length of the wearers waist in the center, with unfolded sections of equal length on either end. 1) They slipped the belt under the folds, so that the lower edge of the plaid hung knee-level when they laid down on it. At this point, they lay down on the plaid, body parallel to the pleats. They wrapped the two unpleated ends around them, lapping them left over right, and fastened the belt. 2) Once they had the belt fastened, the wearer was wearing two layers of material. The wearer had the largest amount of material overlapping their belt and hanging down around their legs. 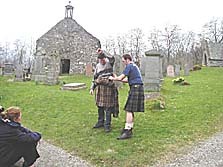 This is how the women usually wore the plaidie. The men generally pulled the top layer up out of their way. 3) The wearer could drape the excess material around their body in a number of ways, depending on the weather and their activities. The two ends in front could be pulled up and tucked in to the belt to create pockets. 4) The remaining outer pleats behind them could be lifted over their head or around their shoulders in the cold or rain, or left trailing behind them in a heat spell. 5) Usually, half of extra material was drawn from the back onto the left shoulder and half drawn up under the left arm across the front and pinned together. This freed the sword arm.